Turkey remains at loggerheads with the United States in one of the worst spats in years over the almost two-year detention of American pastor Andrew Brunson and a host of other issues.But Erdogan urged Turks not to be panicked by the currency crisis, saying: "If they have the dollar, we have Allah". "Threats, sanctions and bullying against Turkey will not work", he said. "I am once again calling on those in America: It is a pity that you choose a pastor over your strategic partner in North Atlantic Treaty Organisation", he said. "Shame on you, shame on you", he said in remarks directly addressed to Washington. 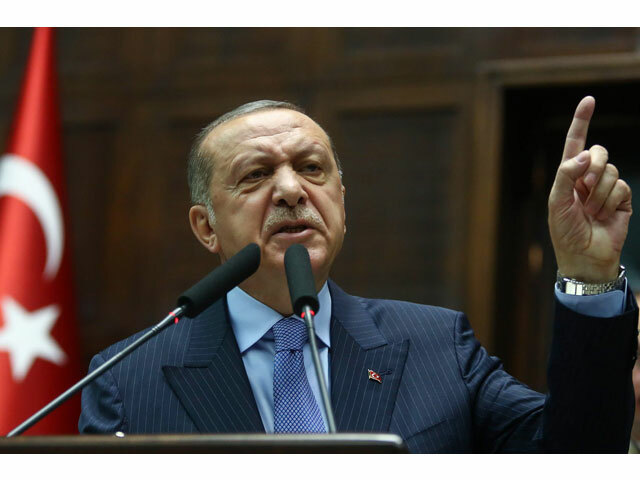 "Those who can't compete with us on the ground have brought online fictional currency plots that have nothing to do with the realities of our country, production and real economy", Erdogan told a provincial meeting of his AK Party in the town of Rize on Saturday, as quoted by Reuters. In his speech, Turkey's president Erdogan lay the blame for the crash at the US's door saying: "If they have their dollars, we have our people, our God". Trump said tariff on aluminum imports would be increased to 20 percent and the tariff on steel imports will be raised to 50 percent as the Turkish Lira "slides rapidly downward against our very strong Dollar!" Turkey remains at loggerheads with the United States in one of the worst spats in years over the almost two-year detention of American pastor Andrew Brunson and a host of other issues. "Those who assume they can bring us to our knees through economic manipulations don't know our nation at all", he said. The lira sell-off deepened concern over whether over-indebted Turkish companies will be able to pay back loans taken out in euros and dollars after years of overseas borrowing to fund a construction boom under Erdogan. Immediately give these to the banks and convert to Turkish lira and by doing this, we fight this war of independence and the future. The worsening diplomatic spat between the two countries sent the lira down 16% against the dollar on Friday. In an opinion piece in the New York Times on Friday, Erdogan said Turkey's partnership with the United States could be in jeopardy unless Washington "starts respecting Turkey's sovereignty". "Our relations with Turkey are not good at this time!" he noted on Twitter. But, the United States had "repeatedly and consistently failed to understand and respect the Turkish people's concerns". "To convey that Turkey does not respond to threats, we retaliated by sanctioning multiple American officials". "Moving forward, we will abide by the same principle: Attempting to force my government to intervene in the judicial process is not in line with our Constitution or our shared democratic value", he warned. Turkey's supreme leader is also clearly angry that the United States has not taken more action against the Gulenist movement and what he said was a failure "to unequivocally condemn" the 2016 coup attempt. The 64-year-old also highlighted the major difficulty in battling the Kurdish insurgency which has full U.S. support for fighting Islamic State fighters in northern Syria. "If Turkey could fulfil these conditions, then the International Monetary Fund might consider giving Turkey a programme but, to me, I doubt Erdogan will do this except as a last resort", Mr Thin said. 'Before it is too late, Washington must give up the misguided notion that our relationship can be asymmetrical and come to terms with the fact that Turkey has alternatives, ' he said. "I have full confidence in this government, I'm sure it will find a way out and reverse the trend", said Erdogan supporter Sabahattin. Although Erdogan struck a defiant tone, his foreign ministry called for diplomacy and dialogue to solve problems with Washington and Trade Minister Ruhsar Pekcan said "we implore President Trump to return to the negotiating table". Erdogan has cast the sell-off in the currency that has followed the trade row as an economic war and an attempt to undermine Turkey's economy.